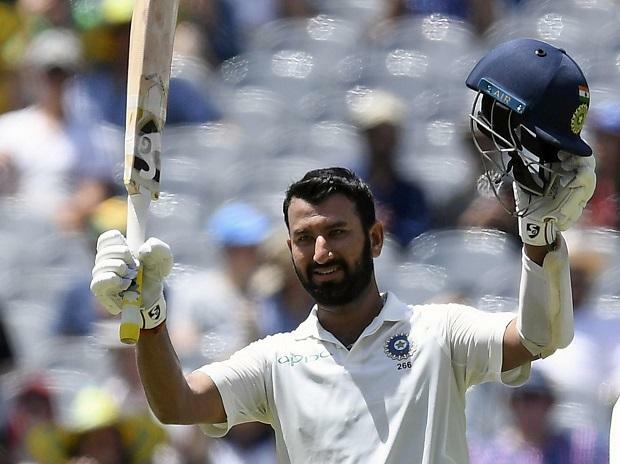 Indian top-order batsman Cheteshwar Pujara played a blistering centurion knock of 130* runs to put India in a commanding position on Day One of the ongoing fourth and final Test against Australia here at the Sydney Cricket Ground on Thursday. Opting to bat first, India managed a total of 303 runs at a loss of four wickets by the end of Day One of the fourth Test. India did not make the best of the starts on Day one as they lost their first wicket in the form of their opening batsman KL Rahul (9) in the second over of the match. Rahul edged an outgoing delivery of Australian pacer Josh Hazelwood which was caught easily by Shaun Marsh at the second slip. After the initial jolt Indian innings was stabilised by Mayank Agarwal and Pujara. Together, they stitched a partnership of 116 runs to put India on the driving seat and made their opponents toil hard on the field. Australia got the much-needed breakthrough in the 37th over of the match when their spin bowler Nathan Lyon gets better off Agarwal (77). The opening batsman gets enticed to play a shot off Lyon's short length delivery which landed straight in the hands of Mitchell Starc at the long on position. The next batsman on the crease was Indian skipper Virat Kohli. The right-hand batsman, along with Pujara, added 54 runs to the team's total before being picked by Hazelwood at the score of 23 runs. Kohli tried to play a shot of length of delivery but the ball hits the skipper's gloves and Tim Paine caught him behind the stumps. This was twice in two innings that Kohli got out in this fashion. At a time when India was losing some crucial wickets in the match, middle-order batsman Ajinkya Rahane walked down to the crease. At the score of 18 runs, Rahane also lost his wicket when a snorting bouncer puts the batsman in a tangle and brushed his top glove to go in the hands of keeper Paine who took an overhead catch. After Rahane's departure, Pujara and Hanuma Vihari added collective 75 runs to solidify India's position in the match. Both are currently holding the crease for India at the respective scores of 39 and 130. For Australia, Hazelwood emerged as the highest wickets taker on the day with two wickets in his kitty while Starc and Lyon contributed with one wicket each on Day One of the match. India are leading the ongoing Test series 2-1 and are eying to clinch the final Test in order to register a historic Test series win in Australia.